Happy International Women’s Day, bookworms! International Women’s Day is a day devoted to the women who have fought for women’s rights throughout history. In celebration of the holiday, I wanted to dedicate today’s post to some women who inspire me. So let’s get right into it! In no particular order…. Malala’s fight for girls’ education worldwide speaks for itself. She almost paid the ultimate price for her activism, and it only made her more intent on achieving her goals. She said it best herself: “Extremists have shown what frightens them most: a girl with a book.” If you haven’t read her memoir, I Am Malala, I highly recommend you check it out, even if you’re not really a memoir person. AOC made history as the youngest woman ever elected to congress, and her status as a newcomer has never made her hesitate to speak out in her new role. She went from bartender to congresswoman with a largely grassroots campaign and has since been a thorn in the side of government officials who are bought and paid for by large corporations. Here’s hoping she has a long political career ahead of her. After the release of Hidden Figures, Katherine Johnson probably needs no introduction. Johnson worked for NASA and was instrumental in the development of successful space travel. She did all this while dealing with marginalization as a black woman entering a largely white male dominated work force in the 1950’s. Hedy Lamarr is best known as an actress, but in recent years efforts have been made to bring to light the work she did in developing spread spectrum technology. She did this in hopes of contributing to the US war effort in WWII, as it would provide a means of sending “unjammable” signals to missiles. The US government, unfortunately, was not interested in her work… until the patent rant out, that is. Today, Lammar’s work provides the basis for a huge variety of wireless communication, from Wi-Fi to GPS and Bluetooth. Carrie Fisher is obviously best known for her role as Princess Leia General Leia Organa, but that’s not why I love her. Fisher spent a great deal of her life speaking candidly about her struggles with mental health. The role such a high profile celebrity can have in reducing stigma around such issues is so important. No one is obligated to feel comfortable speaking about such struggles publicly, but I can’t say enough about how much it means to me that there have been people like Carrie who did. I’ll be honest and say I have some mixed feelings about this entry, given that Rowling has disappointed me a lot in recent years (and not just because Fantastic Beasts 2 was kind of a travesty) but if I’m being honest, J K Rowling’s influence on my childhood can’t be overstated. I was fully on board the Harry Potter bandwagon the moment the first book came out, and those stories are still near and dear to my heart. Hermione Granger helped me, an awkward, bookish little outcast, to feel like maybe there was nothing wrong with being me, and the underlying messages in the HP books about love and social justice are forever ingrained in my heart. Thank you so much for reading! What women have inspired you? Let me know in the comments! On some level, if not intellectual then animal, there has always been an understanding of the power of women’s anger:that as an oppressed majority in the United States, women have long had within them the potential to rise up in fury, to take over a country in which they’ve never really been offered their fair or representative stake. Perhaps the reason that women’s anger is so broadly denigrated–treated as so ugly, so alienating, and so irrational–is because we have known all along that with it came the explosive power to upturn the very systems that have sought to contain it. This book came onto my radar when the author, Rebecca Traister, appeared on The Daily Show this past November. I’ll embed it here, because I feel like the author does a much better job of introducing her book than I can. 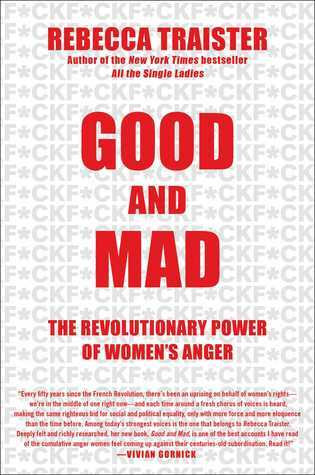 If I had to sum up this book in as few words as possible, I’d have to say “realistic yet optimistic.” Good and Mad seems to be equally devoted to outlining the struggles of women and as well as the historical and contemporary triumphs. The underlying message is that it’s daunting to try to enact change when the deck is stacked against you, and success is never guaranteed, but history has shown us over and over that it is possible. Traister’s attention to intersectionality is very thorough, and she makes a point of outlining how race impacts how women experience sexism in varying circumstances throughout the book. This aspect of her writing feels particularly important when she is addressing large-scale protest movements. The 2016 election saw a large surge of white women with no prior experience in protest suddenly scrambling for a way to make our voices heard. This is a positive thing, but we must also keep in mind that, for the black women who have been embroiled in social justice movements for years, they’re seeing a lot of people who are late to the party. (And before anyone tries to come after me in the comments, no, I’m not implying no white woman attended a protest prior to 2016. I’m a white woman and I protested prior to 2016. The point here has to do with overall trends.) It’s amazing to see so many people inspired to become politically involved, but we must be mindful and look to those with actual experience for leadership. Reading this book in the current political climate is kind of weirdly cathartic. Traister’s points are so well articulated, heartfelt, and unbelievably timely. I cannot recommend it strongly enough. -Lavinia Dock, “The Young Are At The Gates,” The Suffragist, June 30, 1917. Thank you for reading! Have you read Good and Mad? Please share your thoughts in the comments. What are your GoodReads reading goals this year? Let’s discuss! Esther Greenwood is a college student suffering from a profound sense of ennui. She is working a summer internship at a women’s magazine and is finding herself oddly detached compared to the other girls. Most people over the age of 15 or so will find her highly relatable and sympathetic; she has reached that point in her life where she is meant to be making decisions that will impact the course of her life. And she’s not ready. She doesn’t know what to choose in life, but more than that, part of her is resentful at the very notion that she should have to make a choice at all. “If neurotic is wanting two mutually exclusive things at one and the same time, then I’m neurotic as hell. I’ll be flying back and forth between one mutually exclusive thing and another for the rest of my days,” she says. I’m sure there are a select few among us who were practically born with a single-minded mission in life and a clear path ahead of them. The rest of us? Yes, we’ve felt like Esther Greenwood. Plath’s background as a poet shines through in the evocative prose throughout the novel. While the tone is relatively casual in one sense, something that meshes well with the age and background of the protagonist, Plath breaks it up with images and metaphors that hit like a punch to the gut. There is something demoralizing about watching two people get more and more crazy about each other, especially when you are the only extra person in the room. It’s like watching Paris from an express caboose heading in the opposite direction–every second the city gets smaller and smaller, only you feel it’s really you getting smaller and smaller and lonelier and lonelier, rushing away from all those lights and excitement at about a million miles an hour. This is a relatively quick book to read, but it is not easy. I do think that it’s one we all owe it to ourselves to read. Esther’s descent into debilitating depression will stay with readers long after they’ve finished the book. Readers who loved Girl, Interrupted but have not yet read The Bell Jar are depriving themselves. Thank you for reading! If you’ve read The Bell Jar, please share your thoughts in the comments! VOX is a dystopian novel in the vein of The Handmaid’s Tale which expertly blends the personal and the political. Set in an America which has been taken over by hyper-conservative extremists, women are no longer allowed to work, and they are forced to wear word counters which administer painful electric shocks if they go over their allotted 100 daily words. One of the highlights of the novel is Jean’s strained relationship with her husband. Prior to the political shift which left Jean as a second class citizen, she viewed her husband as gentle; now, she views him as meek and cowardly. He privately disagrees with the direction the country has taken, but feels unable to push for change in his professional life, where he works closely with the president. The slow, simmering resentment is palpable. Jean makes a really intriguing protagonist for a novel like this, as she was a highly respected scientist before losing her rights. She was a neuroscientist specializing in Wernicke’s Aphasia and working to develop a cure. Wernicke’s Aphasia leaves sufferers unable to produce meaningful speech; words come to them freely and perhaps even in a grammatically correct sequence, but their sentences are gibberish, utterly lacking in meaning. (An example from the book: “Cookie for your thoughts and when the Red Sox gossiping and galloping, I don’t know. There’s going to be hyper-tension!”) Jean’s life’s work was to help give people back the ability to communicate, and she has now been robbed of that herself. If I have any criticism of VOX, it’s this: I would have liked to see more of the novel devoted to exploring how American society ended up in that state. For example, in The Handmaid’s Tale, Atwood makes a big point of emphasizing how far-right groups pounced on the panic induced by plummeting birth rates. In VOX, it doesn’t feel like quite enough time is devoted to exploring how social mores shifted enough to allow such a drastic change. The America portrayed in VOX is essentially identical to our own… until it isn’t anymore. In retrospect, perhaps this is more ominous than The Handmaid’s Tale. Thank you for reading! Have you read VOX? Please share your thoughts in the comment section. What’s your favorite novel with feminist themes? Let’s discuss!